But never fear my Padawan learners, I am still totally obsessed with weddings and haven’t diverted my attention towards baby blogs and the like. If I’m honest, I find all the stereotypical baby shiz, all a bit vomit inducing. The frilly, cutesy. ‘ooooo, lets all use words shorter than the real word and repeat it twice because the baby will understand me then’ type stuff. Why can’t we talk to our little smurf’s like a normal person? Why do people use words like, ‘neigh neigh’? It’s a horse! A HORSE! You are actually using an extra syllable to describe something very simple, dag nab it! 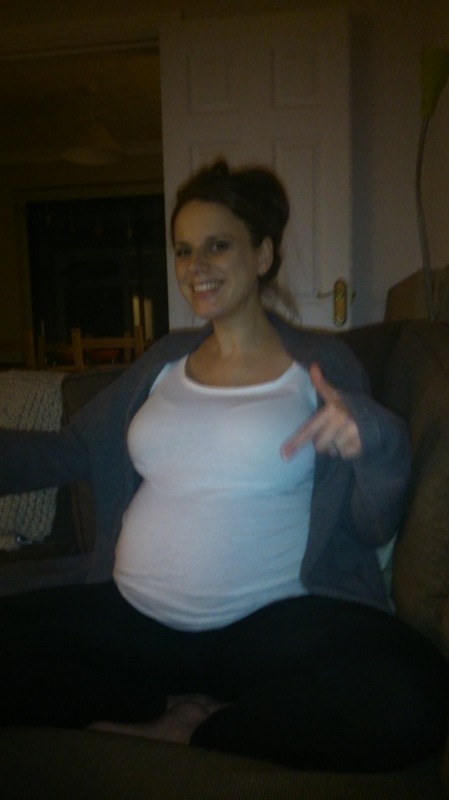 Me (at 8 months pregnant): “I think I might have to duck out of the stationery world a bit earlier than planned as I’m getting a bit snowed under” FYI, there was no cot built and this didn’t happen until 1AM of the day we went into hospital….oops! Jess returns when Dougie is 6 weeks old. What do we learn from this? Hannah is always right and it takes time for your body to get over birthing a person. A special mention has got to go out to another Mommy, of the Hannah’s kind. We’re very lucky to have such supportive families and we couldn’t have got through Dougie-gate without your priceless assistance. So, Thank you! We hope you agree that this is far easier to remember. Our old email contact still works and we will get your emails but all replies will come from the above. We’ve had a bit of a blank out on the social media front for a while, this being because the admin side of Be Our Guest (i.e. me!) went and selfishly moved house. This for me is awesome……for internet based services….this is ruddy rubbish! How annoying is it to have to move your providers, set up new ones and you just KNOW that it never works first time. I’ve spent the first few weeks in our new home, on the phone to our internet provider for about a million hours every evening. But, as you can probably tell from this post, “we now have the power!” Woop! Quick, cross your fingers so it’s not jinxed. What did we actually do before we had the internet? It screws my noodle?? But anywhos, myself and the boy are now all set up and settled in to the new abode, so Hannah can now have her tech support back on hand. 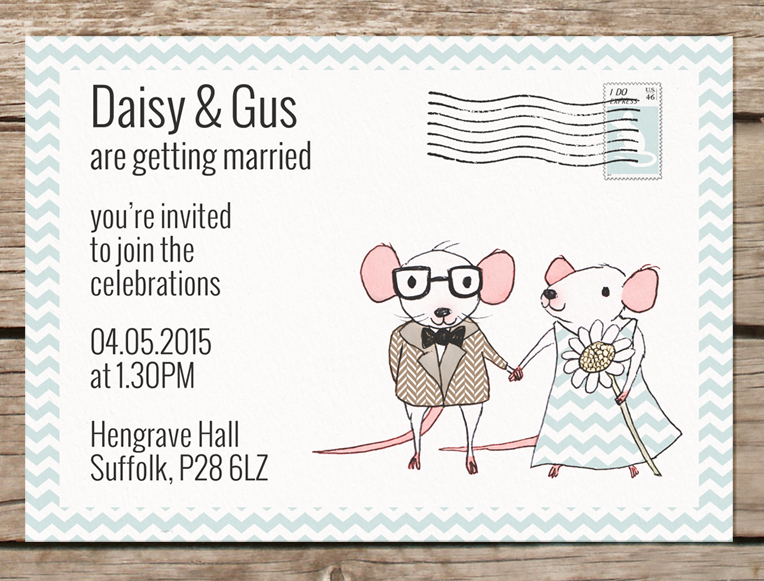 If you follow our Facebook page, you probably would have already met our newest additions, Mr & Mrs Mousington. But if you haven’t, your day is about to improve dramatically! The Mousingtons have been added to our ‘Off the Peg’ range on our website. They’ve been made to feel at home by the rest of our little pals and seem to be settling in nicely. As always, they don’t mind being altered to suit your day. Will the new Mrs be holding a rose bouquet? Perhaps the new Mr doesn’t like blue and has more of a penchant for pink? Don’t pull that face, it could happen! I’m off now to pop my feet up on the new coffee table and indulge in some Pinterest décor. Bliss! Guess what?! We’ve only gone and opened an actual on-line store! But before we get to the nitty gritty, first off, you may have noticed that our last post was drizzled with tinsel. Christmas is a far distant happy memory and if we are honest with you guys, we have no idea where January went. They say that January is dull and depressing and is the home of ‘Blue Monday’. This Monday is meant to be dreary and depressing as the Christmas credit card bills hit the door mat and the month is full of long, dark nights with nothing to look forward to apart from the anticipation that it may snow……..then for the population to moan after one week that they want the white stuff to disappear. Now, if you follow our ramblings and our Pinterest board, you would know that Hannah and I are quite partial to the winter months and we LOVE the snow, even after a week, dang it, even after two! We never get bored of the icy carpet. The only thing that depressed us from January 2014, was that there wasn’t any snow. We’ve keeping our fingers crossed on that front. This is the first chance I’ve had to put fingers to keypad and update the blog. It wasn’t a good look being greeted by some reindeer when the fat man had been and gone for over a month. So in a nutshell, we’ve got a shop *woo! * and we’re uber excited by how many of you guys have asked us to help you with putting your wedding ideas down on paper. Hopefully in my next post I’ll be able to share some of these designs. 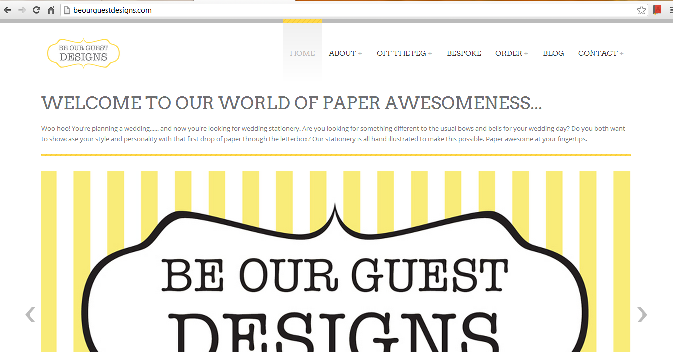 We are always amazed at the styles, ideas and themes that get thrown our way. You guys plan AWESOME wedding days. Keep up the good work. “Christmas doesn’t come from a store…….. I love the sentiment of Dr Suess’s quote from ‘How the Grinch stole Christmas’, as we love Christmas at Be Our Guest HQ. Not just love but LOVES! You may have seen on our Facebook page that we’re taking a little break so we can whole heartedly enjoy the festivities. We pinky promise that we’ll tie up any loose ends before we wave goodbye on December 21st and we’ll be back on it with bells on, on January 2nd. So we’d like to take this opportunity to wish you all a fabulous Merry Christmas. We hope you all have a suitably drunken time* and enjoy every minute! It’s all a little over whelming…. If you follow us on Facebook you’ll know that we’ve had a bit of a busy week in the world of old cyber space. 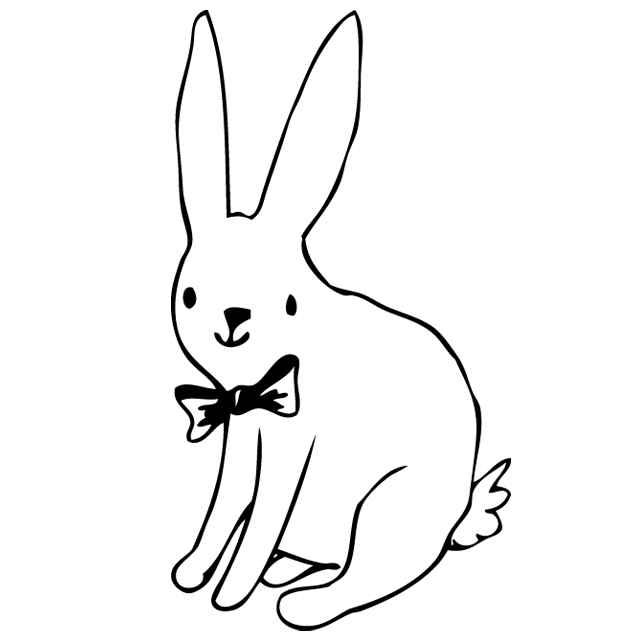 First of all we launched a competition to find a name for our little buddy the bunny. We needed a name for the little chap as he was going to be making an appearance as part of our new logo across all of our social media sites. After you lovely lot entered into the spirit of things, he’s been named Bert, which was chosen by the lovely Kacey Katt, who has won her wedding day invitations as a thank you. It just so happened that the very same day that the spangely new website launched, a little Boho Bride was also launching her lovely blog’s new sponsors. And you never guess what?! We were only ruddy one of them! 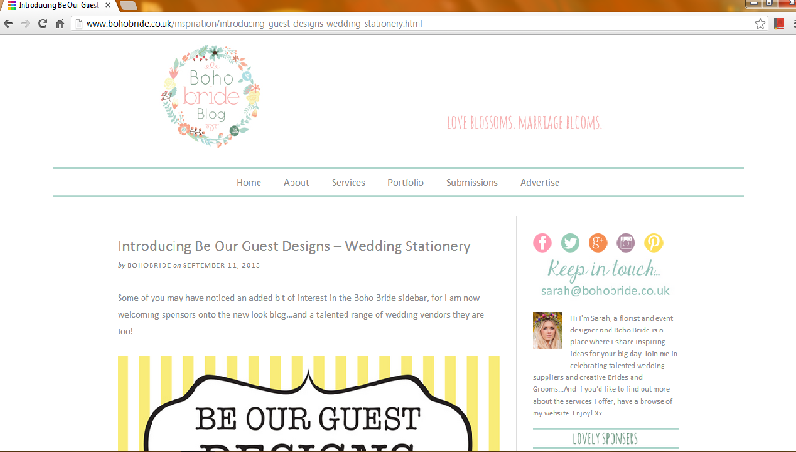 We were over the moon when Sarah at Boho Bride said we could put our little banner on her little bit of boho-ie goodness. 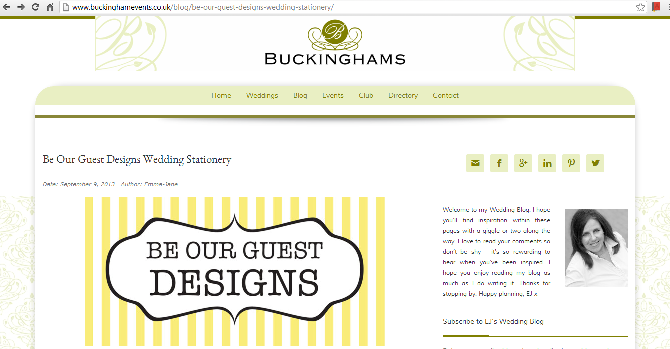 It’s a lovely blog with lots of wedding inspiration and wedding musings. Sarah’s mantra ‘Love Blossoms. Marriage Blooms’, says it all. 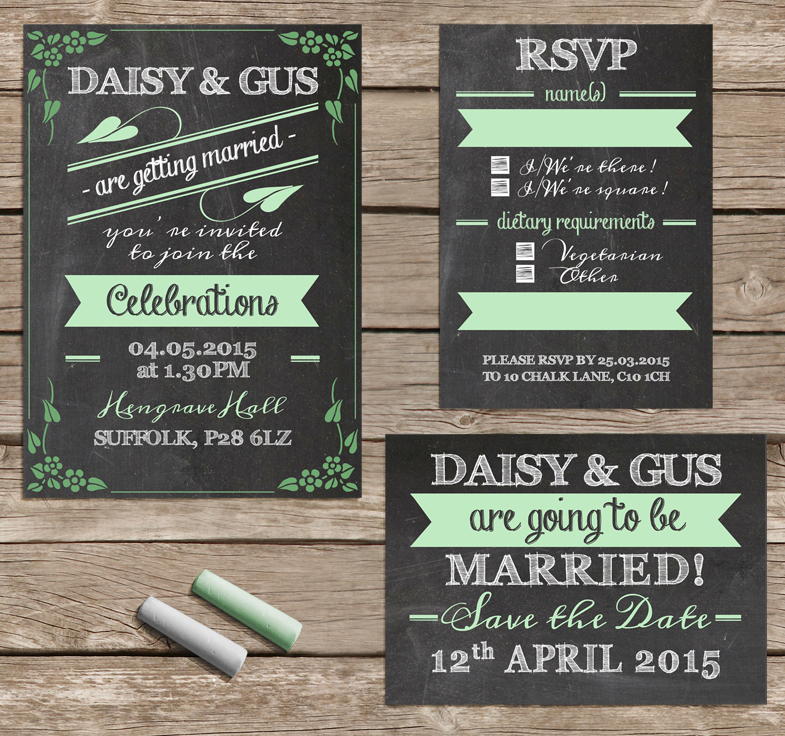 We are super pleased to be sharing this part of our wedding stationery journey with her. 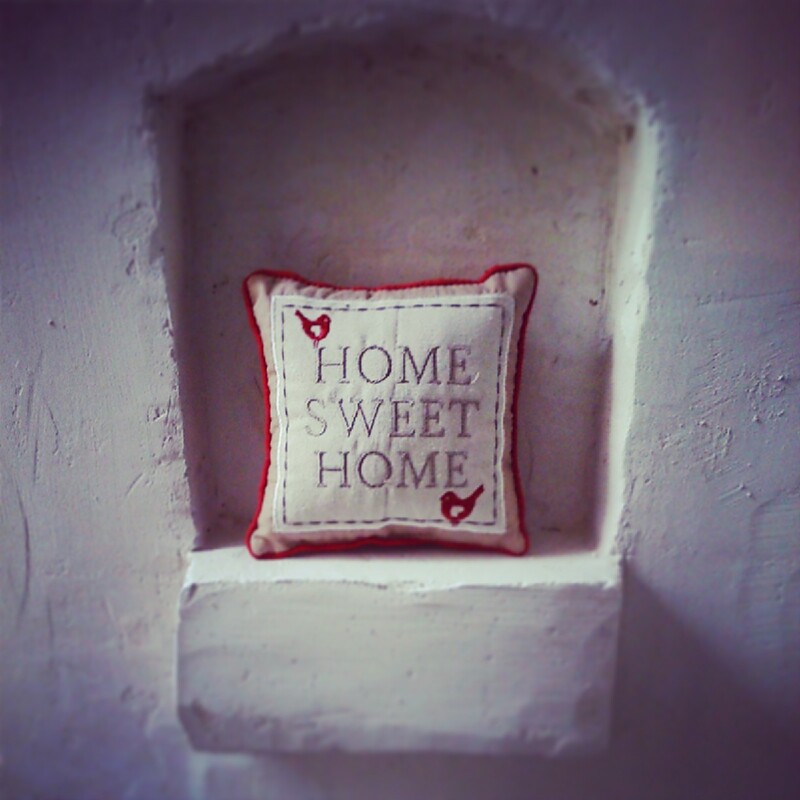 You can visit Sarah’s bit of boho heaven here. Then last month we were contacted by Emma-Jane of Buckingham Events to ask if were free for her next event, the luxury wedding show at the Hilton in Leicester. Number one, it’s super cool to be asked as it is hand picked suppliers and only the best will do 😉 and two, Emma-Jane does an amazing job hosting it. So what do you think our answer was?? Yes of course! 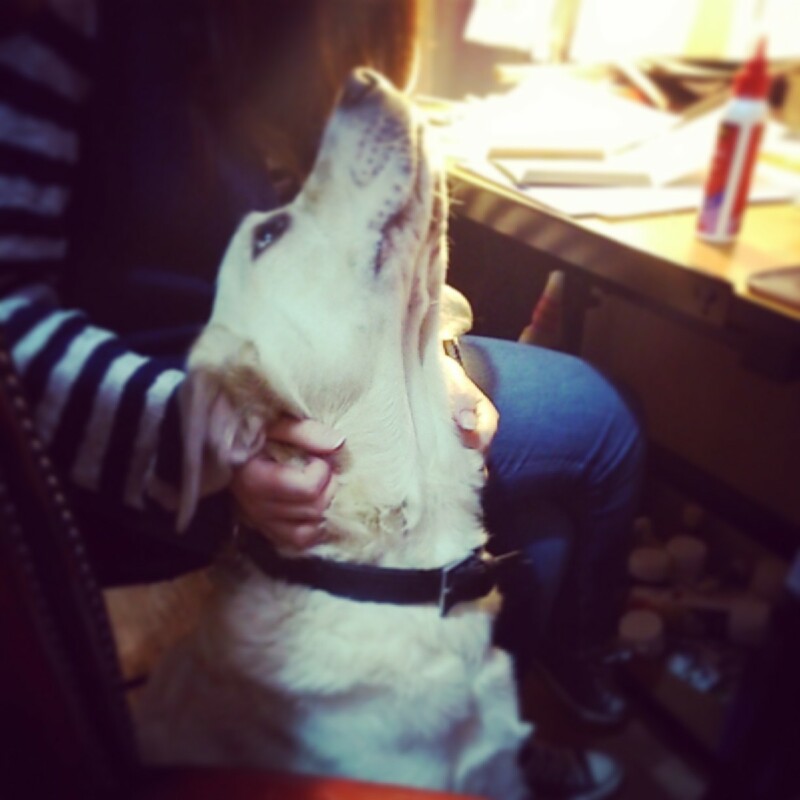 So cue the next awesomely lovely blog about us. We blushed A LOT when we read Emma-Jane’s words. We can never quite get used to such amazing support and feed back. As we’ve said before, the wedding industry is such a supportive environment. If you’d like to come along to the Luxury Wedding show, it’s being held on Sunday 22nd September and you can get your tickets here and they’re free! 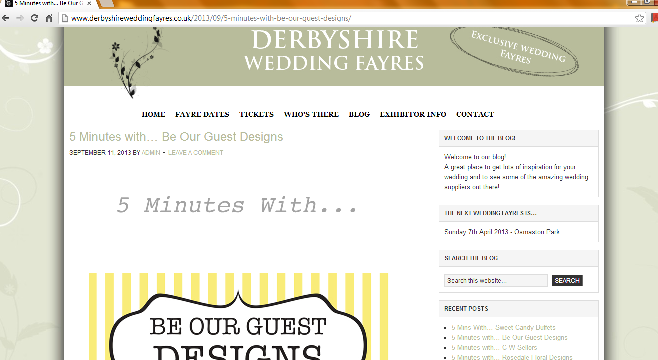 And then to top the week off, we had our ‘5 minutes with….’ blogged about by the guys over at the Giant Wedding Show. It’s a great blog that runs alongside all the information you need about the Derbyshire show, held at Osmaston Park on 20th October. It’s a great way of getting to know all of the suppliers before you visit the show. Here’s what we had to say about ourselves. 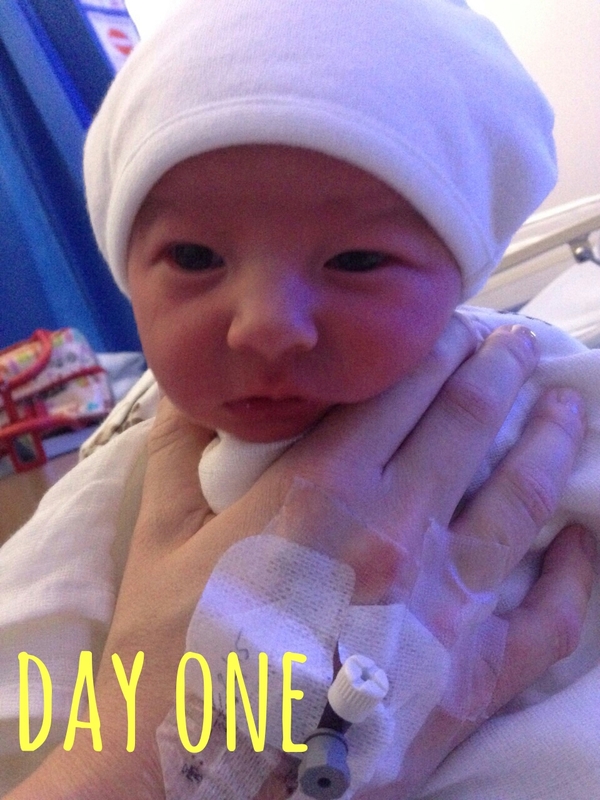 So, that’s our blushingly, over whelming week in the world of the online blog. Thank you to everybody who has taken the time to write about and support us. We really do appreciate it. Now I’m off for an early night, ready to tackle the remaining bits of our new wedding show stand tomorrow. If you’d like to come and see us, have a chat or just to say hi, check out our events page which has all the details of our autumn shows. Hope to see you there!